Vaughn Benjamin and Phillip Merchant demonstrate their musical versatility on "The Cipheraw". 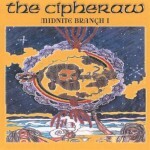 Recorded in St. Croix around the same time as "Seek Knowledge Before Vengeance", The Cipheraw features a different side of Midnite on the Glamorous Records label. The Cipheraw is laden with brutally thick bass lines accentuating jazzy rhythms and horns. Vaughn Benjamin's poignant lyrics are superimposed over these tempos in his own unique style. At times his haunting voice on this album reverberates as if sung in a tube. Amazing!!! Selections such as "Suffara", "Check Yu Self", "Broke Man Dan" and "As Da Ga" are among this writer's favorites. Given the intensity and depth of what Vaughn has to say, lyrics should be included on all of his recordings. This album has something different to offer each listener, and like all of Midnite's music, The Cipheraw seems to offer something different each time you listen to it. The Cipheraw is currently only available directly from St. Croix. Hopefully, someone will undertake to see that The Cipheraw gets the wide-spread distribution that it merits.